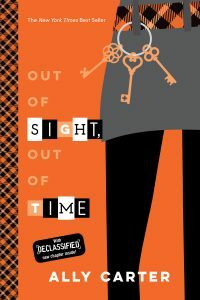 I know it’s going to sound crazy, but the first chapter of Out of Sight, Out of Time actually occurred to me long before it was time to write the fifth Gallagher Girls book. In fact, it occurred to me even before I wrote the fourth Gallagher Girl book. I was probably halfway through book three, Don’t Judge a Girl By Her Cover, when I knew that the people who were chasing Cammie were not going to give up until they’d found her—when I was certain that people close to Cammie were going to get hurt. And I knew that Cammie wasn’t going to be able to stand that. If Cammie was a threat to the people she loved, then she would have no choice (in her mind) but to run away. But I also knew it might be the biggest mistake of her life. I sat down and quickly wrote what would eventually become the first chapter of Out of Sight, Out of Time. I wasn’t sure who those nuns were or exactly how Cammie came to be with them, but I knew that neither Cammie nor I would be able to rest until we had answers to all of those questions, and that that’s what the fifth book would ultimately be about—Cammie’s journey to find exactly what happened over her summer vacation. I hope all of you enjoy reading about Cammie’s quest for answers as much as I enjoyed writing it.